All the programs available from this website are designed for the Microsoft Windows operating system, they won't work on any other platforms (e.g. Mac OS, Linux, etc.) They are compatible with Windows 7 SP1 and later (unless noted otherwise). If you want to buy the full version of any program available here, just click the Buy link above the related Download button or click the program name under the Buy drop-down menu and you'll be redirected to the order form on the vendor's website. Orders and deliveries are handled by MyCommerce (a Digital River company). All the programs on this website are trial versions only (but freeware and donationware), please never install a trial version over a full version even if it is more recent otherwise you will loose the full version; the full versions are only available from the vendor's website. run an application, a command file or open an URL on automatic resumes. As of version 2.1, a suspend.exe command-line tool is included in the installation; you can use it to suspend the system and either make it enter the Sleep state or Hibernation from a command prompt or as part of a script. You can also assign it to a keyboard key. 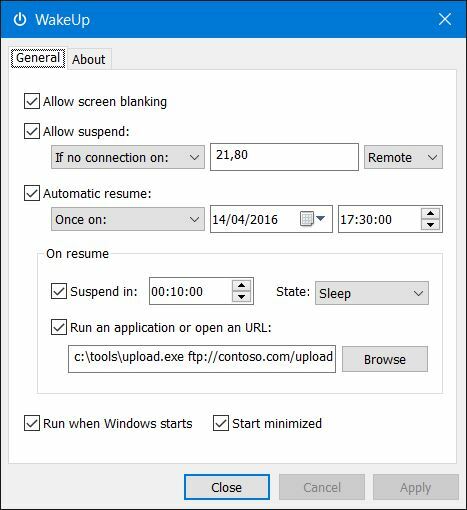 Both the Suspend.exe and WakeUp.exe executable files don't have any runtime dependencies so they can be easily copied to a USB stick if needed to be used on other systems. The Locked Files Wizard, formerly known as CopyLock, is an assistant that allows you to either delete, move or rename files or folders used by the system or any other application or process. You can display and possibly stop the processes or services that use executables, folders or dynamic-link libraries (DLL) and try the operation again to possibly avoid restarting your system and thus save time. The wizard also allows you to quickly pick the image path of a process (Select > File from Process) or a program that runs at startup from the Registry (Select > File from Registry), to manage it. This may be useful to quickly remove worms, trojans or any other malware from a system. Additionally you can manage the pending operations that are delayed until the next reboot. The package includes a command-line version that can be used from a Command window or a script. Disclaimer: you can possibly crash your system or prevent an installed program from working if you are not careful, use at your own risk. 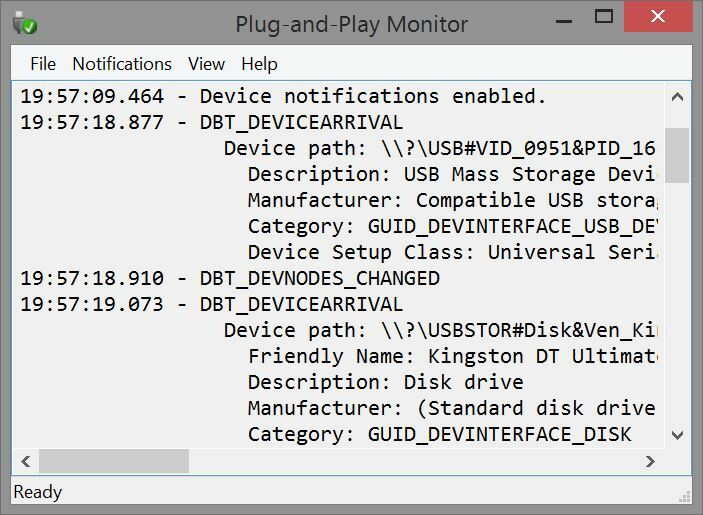 Plug-and-Play Monitor (PnPMon) is an experimental tool that displays plug-and-play notifications from the system and other device notifications. Click the Notifications > Device menu option to start receiving device notifications. This program may come in handy to possibly identify plug-and-play issues or to study plug-and-play notifications. 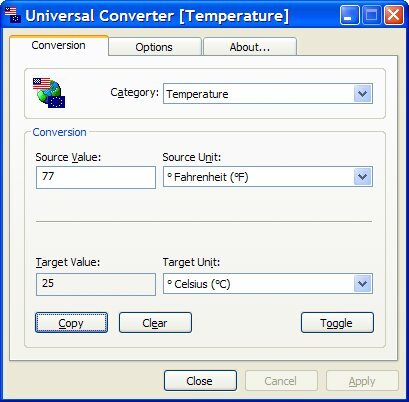 This Universal Converter allows you to convert to and from many UK, US and metric units. To do a conversion, simply select a category (length, speed, surface, temperature, volume, weight, etc. ), select the source and the target units. The conversation is made on the fly as you type the source value. You can also now do some currency conversion, display real-time time differences in two places in the world at the same time and look up country and phone codes. The Close to system tray option allows you to run a single instance of the program and to automatically minimize it to the system tray (the part of the taskbar near the clock) when you close it. If you need the program again, simply double-click its icon in the system tray. Display is a small command-line tool that allows you to change either the display orientation or the brightness or contrast of a specified display monitor or to turn all the monitors or the screen saver on and off to save power. Run display.exe in a Command window to learn more about its syntax. File Downloader is a small command-line tool that allows you to download files from webservers and FTP servers. It can easily be inserted in a script, a batch file or the Task Scheduler to automate file downloads. The program features multiple parameters and options. Type download.exe in a Command window to learn more about its syntax and its parameters. Versions 1.10 and later are Unicode only. File Uploader is a small command-line tool that allows you to upload one or many files (wildcards allowed) to webservers (POST or PUT verbs) and FTP servers. It can easily be inserted in a script, a batch file or the Task Scheduler to automate file uploads. Type upload.exe in a Command window to learn more about its syntax and its parameters. Versions 1.11 and later are Unicode only. DirCmp is a command-line tool that allows you to compare two directories and possibly their subdirectories. The program reports files missing in either directory and whether some files are different or empty. You can also specify a list of files or folders to exclude during the comparison. The output can be redirected to a text file. Simply type dircmp in a Command window to learn more about the syntax of the program. MediaChecker helps you check all your media (fixed or removable like diskettes, zip, magneto-optical disks, or CD-R,...) or only a folder on these media and ensure that all your precious data that you store on them are safe and can be accessed successfully. The latest versions can now run on older systems with just Internet Explorer 3.0. Birthday Reminder is a small application that takes place in the system tray. 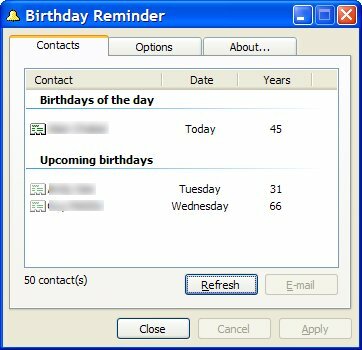 It searches your default Windows Address Book (WAB) and possibly displays the contacts who have their birthdays or wedding anniversaries today (and optionally in the coming week). If some birthdays are available the icon blinks in the system tray, you can then double-click it to display the list of contacts. Select a contact in the list and click E-mail to send him/her an e-mail. You can configure the application to automatically run at startup by ticking the Run at startup option in the menu. CloseApp is a small command-line tool that allows you to close all the processes whose executable filename matches the one passed as a parameter. Alternatively, you can pass a DLL filename as a parameter to close all processes using that library. Run closeapp.exe from a Command window to learn more about its syntax. Note: as of May 2010, CloseApp is not supported anymore and it is replaced by the Locked Files Command available with the Locked Files Wizard package.